Celebration put on by Interior Ministry to "strengthen community ties"
Kids' art projects show Baghdad scenes, including one with toy as dead "terrorist"
BAGHDAD, Iraq (CNN) -- From a distance, it looks like an apparition: a huge multi-colored hot-air balloon floating in the Baghdad sky, bearing a large poster of Jesus Christ. Below it, an Iraqi flag. 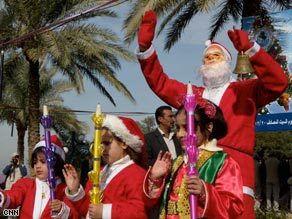 Welcome to the first-ever public Christmas celebration in Baghdad, held Saturday and sponsored by the Iraqi Interior Ministry. Once thought to be infiltrated by death squads, the Ministry now is trying to root out sectarian violence -- as well as improve its P.R. image. The event takes place in a public park in eastern Baghdad, ringed with security checkpoints. Interior Ministry forces deployed on surrounding rooftops peer down at the scene: a Christmas tree decorated with ornaments and tinsel; a red-costumed Santa Claus waving to the crowd, an Iraqi flag draped over his shoulders; a red-and-black-uniformed military band playing stirring martial music, not Christmas carols. Even before I can ask Interior Ministry spokesman Major-General Abdul Karim Khalaf a question, he greets me with a big smile. "All Iraqis are Christian today!" he says. Khalaf says sectarian and ethnic violence killed thousands of Iraqis. "Now that we have crossed that hurdle and destroyed the incubators of terrorism," he says, "and the security situation is good, we have to go back and strengthen community ties." In spite of his claim, the spokesman is surrounded by heavy security. Yet this celebration shows that the security situation in Baghdad is improving. Many of the people attending the Christmas celebration appear to be Muslims, with women wearing head scarves. Suad Mahmoud, holding her 16-month-old daughter, Sara, tells me she is indeed Muslim, but she's very happy to be here. "My mother's birthday also is this month, so we celebrate all occasions," she says, "especially in this lovely month of Christmas and New Year." Father Saad Sirop Hanna, a Chaldean Christian priest, is here too. He was kidnapped by militants in 2006 and held for 28 days. He knows firsthand how difficult the lot of Christians in Iraq is but, he tells me, "We are just attesting that things are changing in Baghdad, slowly, but we hope that this change actually is real. We will wait for the future to tell us the truth about this." He just returned from Rome. "I came back to Iraq because I believe that we can live here," he says. "I have so many [Muslim] friends and we are so happy they started to think about things from another point of view and we want to help them." The Christmas celebration has tables loaded with cookies and cakes. Families fill plates and chat in the warm winter sun. Santa balloons hang from trees. An artist uses oil paint to create a portrait of Jesus. In the middle of the park there's an art exhibit, the creation of 11- and 12-year-olds: six displays, each about three feet wide, constructed of cardboard and Styrofoam, filled with tiny dolls dressed like ordinary people, along with model soldiers and police. They look like model movie sets depicting everyday life in Baghdad. Afnan, 12 years old, shows me her model called "Arresting the Terrorists." "These are the terrorists," she tells me. "They were trying to blow up the school." In the middle of the street a dead "terrorist" sprawls on the asphalt, his bloody arm torn from his body by an explosion. Afnan tells me she used red nail polish to paint the blood. A little plastic dog stands nearby. "What is he doing?" I ask. "He looks for terrorists and searches for weapons and explosives," Afnan says. Her mother, the children's art teacher, Raja, shows me another child's display called "Baghdad Today." "This is a wedding," Raja explains. "Despite the terrorism, our celebrations still go ahead. This is a park, families enjoying time. And this is a market where people go shopping without fear of bombings. This is a mosque where people can pray with no fear." In the middle is a black mound that looks like a body bag. Policemen and Interior Ministry forces surround it. "This is terrorism," she tells me. "We killed it and destroyed it, and our lives went back to normal." A Christmas tale perhaps, I think, but one that many Iraqis hope will come true.